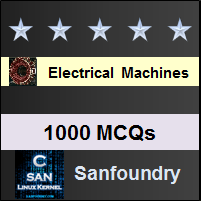 This set of Electrical Machines Multiple Choice Questions & Answers (MCQs) focuses on “MMF Produced by Distributed Windings”. Explanation: The winding MMF depends only on the winding arrangement and the winding current. Explanation: If the coil current is DC, the magnitude of MMF wave does not vary with time and space. Explanation: For AC in the coil, the air-gap MMF wave is time variant but space invariant. The peak value of the sine MMF wave for a 2 pole machine is given by F1p=(4/π)(Ni/2)AT’s per pole= 2/π(Ni) AT. Explanation: The armature MMF for a DC machine remains constant in amplitude and does not depend on the armature speed, also the MMF wave produced is seen to be a triangluar MMF wave. 7. Which of the following statements are correct regarding the current sheet? Explanation: The MMF produced by uniformly distributed current sheet is identical with the MMF produced by uniformly distributed winding. If the distributed winding in the slots is on the rotor, then the uniformly distributed current sheet would be wrapped around the rotor accordingly. 8. A current sheet with sinusoidal current produces? Explanation: A uniform current sheet produces trapezoidal MMF wave and sinusoidal current sheet produces sinusoidal MMF wave leading by 90°. Explanation: When the machine has more than 3 slots per pole per phase, the steps in the MMF wave are neglected and MMF variation is taken as smooth over these slots and as a consequence, stepped MMf wave changes to trapezoidal MMF wave. The trapezoidal MMF wave amplitude =3Ni/2. Explanation: The MMF variation due to one N-turn coil is seen to be a rectangular wave of amplitude +1/2(Ni) or -1/2(Ni). Explanation: Uniform current density J=(20∗3)/(Π/3)=180/Π. Explanation: Sinusoidal current sheet produces sinusoidal MMF wave leading by 90°. Explanation: The peak value of the fundamental sine component Fa for a DC machine is Fa=8/&Pi2;[(z/p)(Ia/a)] AT/pole. Explanation: In a DC machine, armature current doesn’t vary with time. Therefore, the armature MMF wave for a DC machine remains constant in amplitude and doesn’t depends on the armature speed. Hence the armature MMF wave is stationary with respect to stator and armature.